White House Press Secretary Robert Gibbs said Tuesday that the President has put on hold an order for a new fleet of presidential helicopters orginally ordered by the previous administration. WASHINGTON (CNN) - President Barack Obama put on hold an order for a fleet of new helicopters that will cost at least $11 billion, his spokesman told CNN Tuesday. "The president talked to the secretary of defense, and I think as he said yesterday to Sen. (John) McCain, we don't need any new helicopters at the White House," Robert Gibbs said on CNN's "American Morning." Asked if that meant the order was being put on hold, Gibbs said: "That's exactly what he talked to the secretary about." McCain, the Arizona Republican who was Obama's rival for the White House in last year's election, questioned the president about the cost of the new helicopter fleet on Monday. 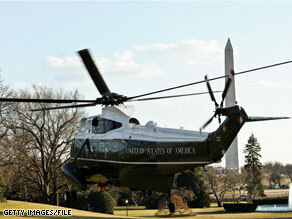 "Your (proposed new) helicopter is now going to cost as much as Air Force One," the presidential airplane, McCain said. "I don't think that there's any more graphic demonstration of how good ideas ... have cost taxpayers an enormous amount of money." The price tag for the proposed new fleet of 28 helicopters has virtually doubled to more than $11 billion over the last six years. Each helicopter in the fleet would reportedly cost around $400 million. President Bush put in the order for new high-security presidential helicopters in the wake of the September 11, 2001 attacks on the United States. The president's helicopter is known as Marine One when he is flying on it. Obama suggested Monday he would put the order on hold. "I've already talked to (Defense Secretary Robert) Gates about a thorough review of the helicopter situation. The helicopter I have now seems perfectly adequate to me," a smiling Obama said to a room of laughing congressional, corporate and community leaders. "I think it is ... an example of the procurement process gone amuck, and we're going to have to fix it," he added. Some people are really a trip. President Obama has only been in office for barely a month and Bush was in office for all of eight years. I didn't hear any public outcry while he was running this country into the ground and now all of a sudden when President Obama is trying to straighten out this mess we are in, everybody is full of ideas and knows what will and what won't work. How the hell does anyone know what this economny is going to do because it has not been in this worse a shape since the Great Depression. I say give President Obama a chance to fix this mess. If you can put up with 8 years of do nothings, then you can damn well wait a year or two to see if we can't turn this mess around. I don't remember McCain bringing this up during the election, or confronting Bush on it face-to-face with cameras rolling. More of the same from the GOP. All grandstanding now that they don't have the power. I only hope the good people of Arizona see through his bull and send him packing next election cycle. Is the GOP still underestimating Obama's ability to detect their traps and avoid them? This people will never learn a lesson. George W Bush ordered helicopters, Obama put the order on hold due to economical crisis. That is the easiest and a common sense decision. But as the GOP hate growing more and more to the point that a Senator is stil saying Obama is not born in USA (McCain officialy born in Panama) and NY post calling for your assassination in a cartoon, well Mr president for your security you need to get at least 3 new secure helicopters. That's rich – Republicans supporters on here "thanking" Sen. McCain for pushing Obama to cancel a Presidential Helicopter program that Bush and the Republicans created and signed off on. Yeah, real magnanimous. Mc Cain was all for this when bush ordered the new helicopter fleet. now he is against it. talk about a hypocrit. go away john, far away. So McCain tries to make President Obama look foolish by criticizing the order that President Bush placed. Senator McCain you fool no one. I would love to see how you voted on the bill that had the funding for the new helicopter fleet included. Aaaawwwww – you mean Nobama's not getting another "new ride"? Some people are really a trip. President Obama has only been in office for barely a month and Bush was in office for all of eight years. I didn't hear any public outcry while he was running this country into the ground and now all of a sudden when President Obama is trying to straighten out this mess we are in, everybody is full of ideas and knows what will and what won't work. How the hell does anyone know what this economny is going to do because it has not been in this worse a shape since the Great Depression. I say give President Obama a chance to fix this mess. If you can put up with 8 years of do nothings, then you can damn well wait a year or two to see if we can't turn this mess around. McCain needs to carry his old behind somewhere and sit down. I agree with the other poster, all he is doing is trying to engage Obama in trivialities and keep crap going. What a jerk.